Oftentimes if your school doesn’t have a full-time behavior specialist, motivation assessment duties are assigned to the school counselor. This can be difficult and you may feel unprepared to do so. Fortunately in my case, our Special Ed team provided me with a fabulous resource for assessing motivation: this Motivation Assessment Scale form which was adapted from V. Mark Durand, Suffolk Child Development Center, N.Y. I used it as I worked with teachers to determine students’ motivators therefore leading to determining possible reasons for behavior. The teacher identifies the behavior of interest and answers the questions to indicate the possible motivators. After adding up the responses, the sum will indicate 1 of 4 motivators; sensory, escape, social attention, or tangible consequences. The team can then use this information to decide next steps. This survey is extra helpful if given to several adults the student works with that way you can see if the behavior and motivators are varied in different settings. While I was waiting for these responses from the staff, I would meet with the student to sit down and discuss what they find motivating. I would typically jot it down on a piece of paper. As you can imagine, it is pretty impossible to stay organized this way so I created this Motivation Assessment Survey for students to fill out. It is available in both hardcopy and digital versions so you can even have students fill it out on an iPad in your office! Completing it digitally makes data collection super easy. See this video for more tips on how to use the digital version and collect data. My Motivation Assessment Survey has four categories to determine possible motivators: attention, leadership, physical rewards, and creative outlet. Check it out here. Students who are motivated by attention feel special when they get to spend time with an adult at school. Example: They can play a game with the counselor during lunch. Students who are motivated by leadership feel special when they get to make big decisions that benefit others. Example: They can choose which book the class reads. Students who are motivated by physical rewards feel special when they get a tangible or treat. Students who are motivated by a creative outlet feel special when they get to express themselves artistically. Keep in mind that you want to ultimately build intrinsic motivation where students aim to succeed regardless of a reward. 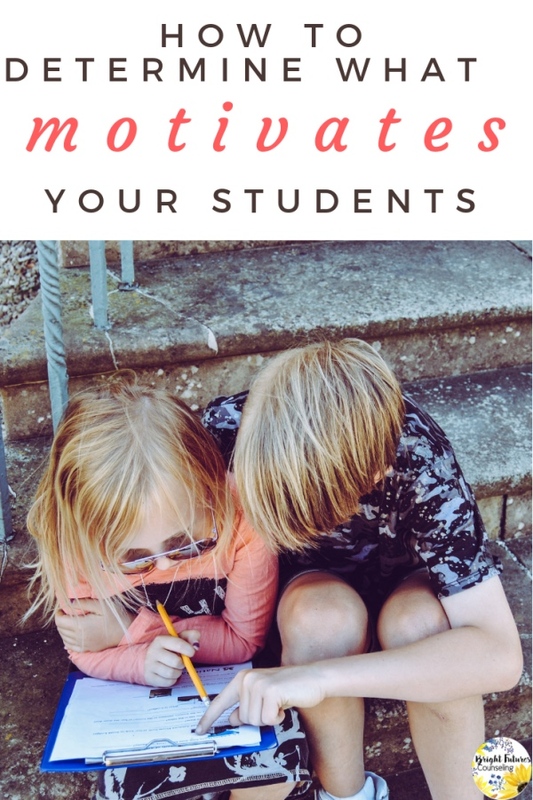 These motivators are a good starting point to modify behavior and are intended to help students get on the right track. Once they have built a habit of doing the desired task, then you can have a deeper discussion about their progress and discuss the “why” behind what you’re asking them to do so they can identify its value. While it may not be the most fun part of our jobs, assessing a child’s motivators helps to determine what causes behavior and overall promotes a positive school climate!